Mondelez International’s Honey Maid brand has launched a “Made Co.” site where kids ages 6 to 12 have opportunities to have their ideas brought to life by creative professionals. The site ties in with new TV spots for the brand’s latest product extension, Honey Maid Grahamfuls, which also feature real children’s creative achievements. Both the ads and the Made Co. initiative are from Droga5 New York. For one 30-second spot, professional directors worked with an 11-year-old to bring his original concept about Honey Maid Grahamfuls to life, using stop-motion animation. A second spot features a 14-year-old fashion designer who created a dress line inspired by Grahamfuls flavors. 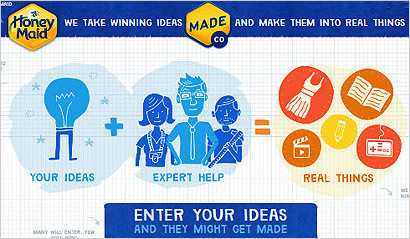 For Made Co., a rotating roster of professionals from businesses including book publishing, clothing design, and game and toy manufacturing will post briefs on the contest site, and review submissions along with Honey Maid. In one contest, kids write a story about the funniest, most amazing or most embarrassing day they can imagine having. The winner and a parent will travel to New York City to participate in a writer’s workshop with “My Weird School”book series author Dan Gutman at HarperCollins’s headquarters and work with the author to turn the idea into a real book (10 copies will be produced by the publisher). In another contest, kids submit stories about their “best day ever,” using a Phineas and Ferb Comic Creator platform on the Made Co. site. The grand prize winner will receive a digital art tablet and a trip with his/her parent to Los Angeles for a one-on-one drawing workshop with a Phineas and Ferb animator. Nine first-prize winners will receive a digital art tablet. In a third contest, kids submit ideas for a heroic character that will be designed and incorporated into an upcoming game on Miniclip.com. The winner will learn how Miniclip turns his/her character idea into the star of a Miniclip game, along with a prize pack including a mobile device filled with Miniclip games and a private video game launch party. Mondelez International Senior Marketing Director Gary Osifchin said that Made Co. was launched to encourage kids to create content and explore their creativity, rather than just consume content. The Made Co. site’s product sell approach is minimal. Grahamfuls are described, along with a link into an area of the Honey Maid site that features the new animated TV spot and more information about the brand’s products. The brand has also recently introduced Honey Maid Angry Birds Honey Grahams and Honey Maid Lil’ Squares.